Cardiovascular system impairment has been observed in children and in liquidators exposed to the Chernobyl nuclear power plant accident. No experimental studies of animals have analyzed whether these disorders might be attributed to chronic ingestion of low levels of cesium 137 (137Cs). Biochemical, physiological, and molecular markers of the cardiovascular system were analyzed in rats exposed through drinking water to 137Cs at a dose of 500 Bq kg−1 (6500 Bq l−1). Plasma concentrations of CK and CK-MB were higher (+52%, P < 0.05) in contaminated rats. No histological alteration of the heart was observed, but gene expression was modified in the atria. Specifically, levels of ACE (angiotensin converting enzyme) and BNP (brain natriuretic peptide) gene expression increased significantly (P < 0.05). ECG analysis did not disclose any arrhythmia except ST- and RT-segment shortening (−9% and −11%, respectively, P < 0.05) in rats exposed to 137Cs. Mean blood pressure decreased (−10%, P < 0.05), and its circadian rhythm disappeared. 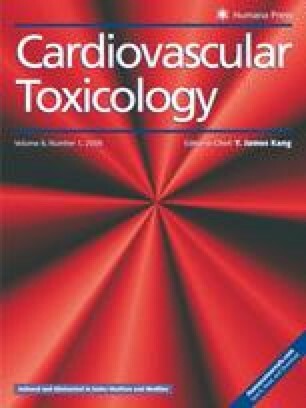 Overall, chronic contamination by an extreme environmental dose of 137Cs for 3 months did not result in cardiac morphological changes, but the cardiovascular system impairments we observed could develop into more significant changes in sensitive animals or after longer contamination. Yann Guéguen and Philippe Lestaevel participated equally to this work. The authors thank T. Loiseau and P. Voyer for their assistance during animal exposure and experimentation. This study was part of the ENVIRHOM research program, supported by the Institute for Radiological Protection and Nuclear Safety (IRSN).